The end of 2018 is fast approaching, and it feels like every year gets more intense, with crazier headlines, angrier politicians, and biggerhashtags. 2018, too, was already a record year in many ways- and not always in the good sense of the word. For example: a record total surface area burnt to the ground in the California wildfire season this year, with well over 6,000 km2 affected by the fires. Wildfires are by no means uncommon in this Pacific state, with a more or less accepted wildfire season in summer and early fall. This summer, too, fires broke out: by August 4th, a national disaster was declared because of their size and frequency. Afterwards, the fires died down for a few weeks, and media attention faltered. That is, until the month of November hit- suddenly, new fires emerged, among which the Camp Fire. 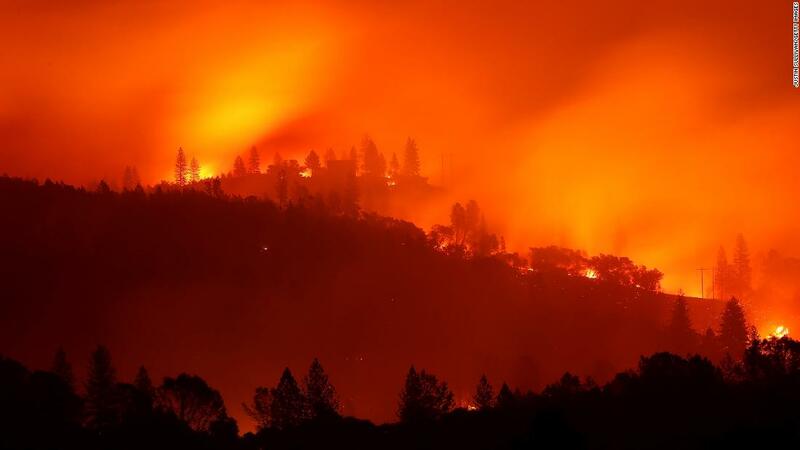 It has been the deadliest and most destructive wildfire on record and has killed 56 people; firefighters only expect to have it fully contained by the end of the month. Several towns will need to be completely rebuilt. California had been facing a long drought already, with over 200 days without any substantial precipitation. Combined with strong winds and an increased risk of fires caused by climate change, only a little accident was needed to start a large fire. The influential Pacific Gas and Electric Company is fearing a lawsuit, as lots of their equipment like poles and power lines have been involved in fires in recent years. However, experts are still investigating the causes of the biggest fires. President Trump blamed the mismanagement of the forest areas in California for the spreading fires. Firefighters reacted angrily, pointing out that nearly 60% of these areas is managed by federal government agencies who are responsible for the land, as they have legal ownership of it. Even Miley Cyrus and Kim Kardashian got involved- the fires nearly reached their property in the areas around Malibu. As the media once again focuses on California, the differences between this coastal state and the rest of the United States are highlighted. California is incredibly diverse: there is a variety of landscapes that allow for surfing and snowboarding in the same day, many different religions are represented with varying degrees of conservativeness, and numerous big cities like Los Angeles and San Francisco are ethnically diverse as well. It is a state with many faces. California houses many universities and research institutes, boasts monolithic tech companies in Silicon Valley like Google, and has the largest economy out of all the American states. However, it is also deeply segregated, notoriously expensive, and has high rates of homelessness and air pollution, as well as a growing debt. No matter what you make of these conflicting views on the Golden State, it is doubtlessly very distinct from the rest of the United States. Parents are not required to list their baby’s gender on the birth certificate, there are numerous men’s restrooms with changing stations and it is a ‘’blue state’’ (voting Democratic) through and through, which is mostly due to the heavily left-wing views on immigration. There are, in my opinion, few people who better embody California than the American author John Ernst Steinbeck Jr (1902-1968). He is best known for his Pulitzer Prize-winning work The Grapes of Wrath from 1939. His life story is infused with the essence of California in every sense of the word, from his birth in Salinas onwards. Steinbeck had a typical upbringing that made him a bohemian type- he attended classes at Stanford University every now and then for six years, but never graduated. When he needed to pay his tuition fees, he would find odd jobs in manual labor (to be fair, this was still possible at the time- nowadays, tuition fees at Stanford lie between 16.000 and 20.000 dollars a year). Steinbeck enjoyed making connections with people that lived outside of mainstream society, and his close relationship to everyday people is reflected in works like Cannery Row and Of Mice and Men. There is no way around it- Steinbeck was an intense, outlandish type. He became fast friends with a man named Ed Ricketts, who he met at the dentist- Ricketts was busy pulling out his own tooth because the dentist was taking too long. Steinbeck had two failed marriages before he married his third wife Elaine; many of his manuscripts were rejected, and he felt lonely in his professional struggle and then alienated once he became famous. ‘’Nine tenths of a writer’s life do not admit of any companion nor friend nor associate. And until one makes peace with loneliness and accepts it as a part of the profession, as celibacy is a part of priesthood, and until then there are times of dreadful dread. I am just as terrified of my next book as I was of my first’’. Steinbeck is California- aware of the dangers, the risks, the disasters that are surely to come. But he has an eye for the beauty, the sights, and the spirit of the Golden State. ‘’I think I would like to write the story of this whole valley, of all the little towns and all the farms and the ranches in the wilder hills. I can see how I would like to do it so that it would be the valley of the world.’’- John Steinbeck, 1933. Next Next post: Bohemian Rhapsody: Exciting Biopic, or Moralistic Tale?